The first keyword here is "daily unique visitors". So how does Alexa know how many visitors you have per day? Obviously someone must "tell" Alexa the IP the users coming from, which in this is case is the Alexa toolbar/widget itself. Install Alexa Toolbar extension from there. You should see Alexa icon on your browser toolbar after restarting your browser. The toolbar will automatically send and receive your site information from Alexa database when you land on your website. Below is a screenshot example after clicking on the icon. The rank by country is calculated using a combination of the estimated average daily unique visitors to a site and the estimated number of pageviews on that site from users in that country over the past month. 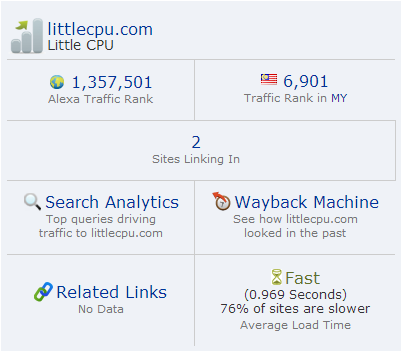 For example, if most of your users are coming from Malaysia, "Traffic Rank in Malaysia" will be shown. Note that if the rank is too low, the country ranking may not be available. Select a desired widget, enter your URL, and click on "Build Widget". Paste it on your HTML page template. That's it. Next time your page is loaded, Alexa information will be retrieved and it will improve your ranking. Last but not least, do not too concern about the Alexa ranking as it is just a rough estimation especially if the ranking is 100,000 and above. The closer your ranking to #1, the more accurate it is.